Dr. Supratim Chowdhury is Associate Professor at the West Bengal University of Animal and Fishery Sciences (W.B.A.F.S. ), Kolkata in the Department of Fish Processing Technology. An alumnus of W.B.A.F.S., he has a PhD in Food Technology and Biochemical Engineering from Jadavpur University, Kolkata. Barnamala Roy has a MA in English from Presidency University (Kolkata, India). She has worked as a Sub-Editor with Kindle Magazine based out of Kolkata where she covered articles on literature, culture, philosophy, gender and society.Currently, she is exploring the community occupations around natural ecosystems and native species in remote areas of West Bengal. She also freelances as editor and translator. The idea of women empowerment, evolving through the international conferences organized by the UNDP throughout the 1990s, has cited five components integral for its materialization. According to the guidelines mentioned in UNDP’s website, these are as follows: 'women's sense of self-worth; their right to have and to determine choices; their right to have access to opportunities and resources; their right to have the power to control their own lives, both within and outside the home; and their ability to influence the direction of social change to create a more just social and economic order, nationally and internationally.' In India, the formation of Self-Help Groups and Cooperatives for women has focused primarily on economic independence, finding it a precursor to social and political empowerment. The Indian subcontinent (and West Bengal) has always recognized the importance of women in the social and political sphere -- case in point being prominent figures like Rani Rashmoni and freedom fighter, Matangini Hazra. The most popular annual festival in West Bengal is Durga Puja, where the strength of the mother goddess in eradicating evil is worshipped. The iconoclastic and dark figure of the intimidating Kali, goddess of the night and cemeteries, captures the public imagination through widely popular Shyama Sangeet/songs. A study of the Jafarpur village, (which is now home to the SHG called Jafarpur Ornamental Women’s Fish Cooperative), also reveals the intermingling of religious faith, nature and the ‘feminine principle’. A garlanded plant stands outside almost every household; the members of the Mahila Samiti say that it is the symbol of the Goddess Manasa, originally a tribal deity-now incorporated into the larger Hindu pantheon, who cured snake-bites and bestowed fertility and prosperity. The families worship this goddess with milk and bananas and the ritual of ‘Ranna Pujo’ or cooking festival, peculiar to the inhabitants of West Bengal, has also developed round ‘Ma’ (mother) Manasa. A branch of the Manasa plant is indispensible for the cooking festival, which also coincides with a house cleaning spree, every September. Instead of appointing priests, the women of the household cook an array of dishes throughout the night, and the eldest woman in the family offers the food to the goddess the next day. Though this culture perpetuates the age-old trope of associating the feminine with nature, the direct (and often, exclusive) involvement in the religious rituals by women members (prior to and after the formation of the Cooperatives) gives them a position of prominence, because religious affairs rank high among the priorities of the villagers. The SHG concept was first promoted in Bangladesh in 1975 by Prof Mohammed Yunus. The savings and micro-credit loan system to the SHGs started during that period through the Grameen Bank of Bangladesh. The concept was later introduced in India in the year 1986-87 by National Bank for Agriculture and Rural Development (NABARD) (Das 2014). In 1999, the formation of SHGs got further impetus with the Government of India launching the Swarnajaynti Gram Swarozgar Yojana (SGSY) and the linkage with the banks was initiated (Chatterjee and Kundu 2011). SHG refers to a group of 10-20 local women in a village, who are linked to a bank and act as a financial intermediary (Maheshwari and Goyal 2016; Das 2014). The members work in close company and gain skill in handling finances, credits and utilising the credit in implementing enterprises. Such enterprises like ornamental fish farming generate the necessary income for the members of SHG and help in achieving economic and livelihood security for them. Presently, there are over 1,00,000 SHGs in West Bengal formed under various schemes through Government and Non-Government Organisations (NGOs). SGSY scheme is by far the most popular scheme under which nearly 55,699 SHGs were formed. Following the formation of the SHG the members are trained in two broad aspects: a) Technical Training or Skill Development Training and b) Banking Training. The technical training is imparted to the members to develop their skills in the trade of their choice such as agriculture, horticulture, animal husbandry, dairy and fisheries (Mandal, Dutta and Laha 2012). The State Government gives a lot of emphasis on skill development on ornamental fish farming. Several SHGs and co-operative societies are now engaged in ornamental fish farming and allied activities. This trade plays an important role in assuring the economic and livelihood security of the rural women. This in turn, results in women empowerment, which is the primary objective to alleviate poverty. Apart from gaining technical skills, the members of SHGs are also expected to be conversant in banking activities which essentially includes savings, loans and repayment of the loans through successful entrepreneurship. SHGs that perform satisfactorily and revolve the allotted fund successfully for a period of one year are graded and made eligible to further financial assistance from banks. The SHGs that have successfully completed the first year are declared to have passed the first gradation. Such SHGs are then eligible for assistance to an amount of INR 5 lakhs for implementation or expansion of their projects. Such financial assistance usually comes interest free and at times the government extends subsidy schemes as well. Several SHGs are further organised into clusters, sub-clusters and federations (Mandal, Dutta and Laha 2012). In West Bengal, 83 such women ornamental co-operative societies were formed involving 1650 members and these rural people are earning a modest income through this trade (Department of Fisheries, West Bengal 2016). Traditionally, women in West Bengal have played an important role in the fishery sector. Women involved themselves in fishing from shallow waters to meet the requirement of their family and at times in local market sales depending on the catch. In the commercial fishery sector they still are engaged as waged labour for de-heading and peeling of shrimps, dressing of fish, cleaning, washing, icing, making and mending fishing nets, collection of prawn and shrimp seeds from estuarine waters and most importantly in different activities of ornamental fish farming. Thus, women in rural Bengal were not only homemakers, but had already learnt to earn money and establish food security for their family, before the loans to organize Cooperatives became available to them. To augment the process of women empowerment, the government at the state and national level emphasized on ornamental fish trade. The trade has a huge prospect globally and has emerged as a lucrative commercial aquaculture venture. The ornamental fish keeping which started as a hobby across the world, owing to its burgeoning demand in national and international markets, has turned out to be a commercially traded commodity in different parts of the world. The sector has been recognized for its ability to generate employment opportunities, alleviating poverty and contributing to the growth of national income by enhancing foreign exchange earnings. With the phenomenal increase in the demand of ornamental fishes worldwide, more countries have realized the economic potential of this sector and intervened directly to promote its development. The ornamental fish trade at retail level is worth more than US$10 billion with an average annual growth of over 10 per cent (Dey 2016). The present domestic market for ornamental fishes is INR 300 crores and provides jobs to around 50,000 people through 5,000 aquarium retail outlets and an equal number of production units (Vinayak 2017). The activities are mostly concentrated in the states of West Bengal, Maharashtra, Tamil Nadu and Kerala. Although ornamental fish farming and its allied activities in India is a male oriented trade, West Bengal boasts of substantial involvement of women in the ornamental fisheries activity. This is basically because ornamental fisheries are structured around SHGs and Cooperatives in which the presence of women is predominant. The SHGs are engaged in both breeding and rearing of the ornamental fishes. Live bearers such as guppy, platy, molly and swordtail are bred and subsequently reared while the egg layers such as angel, barbs, gold fish, tetra and catfishes are reared after procurement of their seed. Several costly exotic varieties such as oscar and arowana also have a good market demand. After successful completion of the training and following several hands-on training programmes, the women beneficiaries gain confidence to start their own farming and breeding initiatives and market their produce. Model bankable projects are available with the Department of Fisheries (Government of West Bengal), NABARD and NFDB. Such projects may be adopted by SHGs financed by bank. The Jafarpur Mahila (Women) Association of ornamental fish farmers was founded by Sujata Gure and her husband Ranajit Gure; they assembled fifteen women whom they trained in ornamental fish activities in the village of Jafarpur (South 24 Parganas) till they became eligible- as an organization- for a loan of Rs. 65,000 from Benfish. 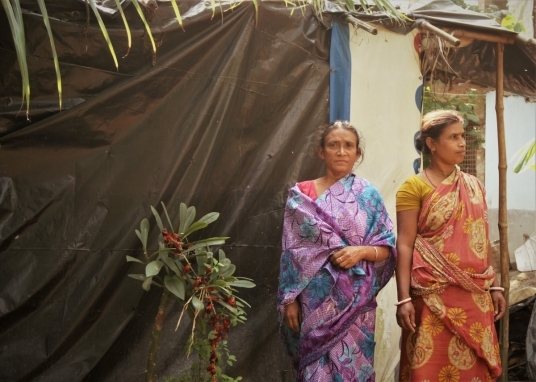 Talking to Sujata Gure, currently heading the Cooperative of thirty-six women, however, reveals that married women still consider managing the family their primary responsibility. 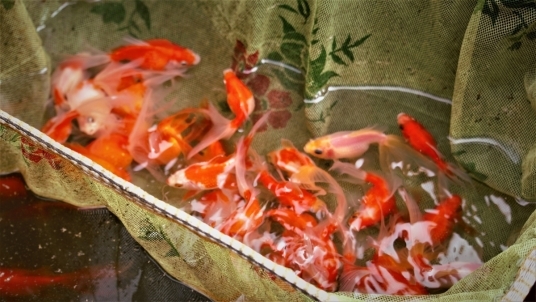 Once, they have completed their household chores, they lend a hand in their husband's enterprise of ornamental fish. Though both men and women know the fish-craft equally well, it is the men who wade knee-deep in water, releasing the fish in the ponds or collecting them before they are marketed. The weekly visits to the market to sell the fish to shopkeepers are also undertaken by men; while women add to the repository of local knowledge about fish care from the training programs conducted by the State and Central fishery institutes, the men guide their production of certain variety of fish by following the market trends. Both add to the local knowledge, either through technical know-how, or practical business skills. In such a scenario, where Sujata is strictly emphasizing the gendered division in farming labour, one is naturally led to inquire why the Cooperatives are women-centric. In response, she says that financial aids to set up the basic infrastructure for farming were only available to women in this sector, because the need for female empowerment was government-recognized. When the finances for managing an enterprise are handed over to the women and handled by them, they gain confidence as ‘earning’ members of the family, slowly coming to recognize their potential to contribute socially and aim for a holistic improvement of their conditions, feels Dr. Bijoy Kali Mahapatra, Principal Scientist at CIFE. Besides the objective behind this empowerment scheme was to turn the backyards of dwellings into production centers of these fish, and thus, to provide economically backward women with the basic amenities with which they could start fish farming, then and there, either to run the family or to earn a little extra income without the intimidation of looking for employment outside of home. It is interesting how women fish farmers have actually incorporated the farming activities into their daily responsibilities. Sunita Guchhait from the Jafarpur Cooperative prepares forty chapatis every alternate day for the ornamental fish in her backyard; she has identified how the fish prefer the cooked bread over flour dumplings. In matters of breeding, the women follow the Bengali seasons, and schedule their activities according to the waning and waxing of the moon, not unlike the following of religious rites. The women of the Cooperative have put together a common fund from their monthly savings after selling the produced ornamental fish. They keep aside this money for use in times of natural disaster leading to a dip in fish production, or during a personal crisis of a Samiti member. This is an independent initiative outside the influence of any funding body or fishery institute, says Sunita Guchhait. SHGs and co-operatives now have new avenues to venture starting from development of public aquaria, their annual maintenance, supplying aquarium accessories and even export. The trade is reported to generate income of INR 6000 to 50000 per month based on the scale and nature of activity (De and Ramachandran 2011; Ghosh 2016). At Dasnagar (Howrah, West Bengal), every lane is lined with fish shops where fish packaging activities are in full swing from early in the morning to late in the day. While the fish packers are mostly male, many women run this enterprise with wholesale shops named after them. A local young woman, Nomita Digey manages Rabin Mayur’s wholesale outlet of aquarium appliances at Dasnagar. Homemakers from the neighbouring households supplement the family income during their free hours by assembling moulded fiber glass aquaria, accessories like filters, thermostats, ornamental plants, stones, light fittings, toys, models for aquaria and feed. School girls also earn their pocket money by making artificial plants by the dozens. Thanks to the ornamental fish sector, a woman like Swagata Das from the northern outskirts of Kolkata, who was earlier confined to the four walls of her home, is a known face, recognized by the government for uplifting the women of her community through this trade. Her society also has bagged contract with several organisations for year round maintenance of the aquaria. The potential of ornamental fish farming as a livelihood option is now well established. The trade does have a huge prospect to earn foreign exchange as well. Considering these facts, the Union Commerce and Industry Ministry under Government of India has planned to launch several initiatives to promote the trade. Recently, the Marine Products Export Development Authority (MPEDA) launched a scheme for setting up of breeding units of ornamental fishes. Registered SHGs and marketing societies are eligible to adopt the scheme, which involves a financial assistance at the rate of 25 per cent of the total investment. A total of 22 units are so far been financed by MPEDA during 2015-16, at a cost of INR 95.01 lakhs. MPEDA also conducts training programmes on aquarium fabrication, assembly and live feed production to boost the aquarium trade. In order to make the indigenous ornamental fish trade and export sustainable, MPEDA has launched 'Green Certification' scheme. The aim is to check the harmful impact of wild collection of ornamental fishes from nature (India Today 2017). The Government of West Bengal is also promoting ornamental fish farming as a livelihood option for women SHGs. The promotional campaign involves organising Annual Bengal Fish Festival and opening doors for corporate investments in the sector (Department of Fisheries, West Bengal 2016). The ultimate aim is economic growth and rural development through women empowerment. The State Government with assistance from National Fisheries Development Board and Rastriya Krishi Vikash Yojana has implemented several successful ornamental fish farming projects in the state. West Bengal produces a major share of the ornamental fish for exports from India. Most of these exports include indigenous varieties of fishes caught in the wild which come to Kolkata from North Eastern states and sub-Himalayan West Bengal (Pal 2015; Paul and Chanda 2014). Domestic trade involves mostly exotic species which are bred and reared in the state by SHGs. However, the diversified areas of the trade including the marine ornamental fish, aquarium accessories business, aqua medicine, feed, etc., remains totally untapped (Ghosh 2016). These avenues need promotion from the Government and motivation on the part of the SHGs. Private Public Partnership in the trade will further boost the trade and will directly consolidate the financial stability and social security of the women members of SHGs and Co-operative societies. Ornamental fish farming provide huge possibilities for empowering women economically. Economic empowerment in turn removes any existing social disparity. Thus, the dream of women empowerment through cultivation of 'self-worth' that makes them eligible to have better 'control over their own lives' is achieved, and the lives of rural population improves, consolidating the nation as a whole. Chatterjee, B. and Kundu, S. 2011. ‘Gender and Development: SHG’s, Women Workers and Enterpreneurs.’ Journal of Economic and Social Development 7(2): 84-97. Das, Rabin. 2014. ‘Women’s Empowerment – Great Ideas, Great Minds' - A Special Focusing on Self-Help Group (SHG) For Women’s Empowerment as Well as Rural Development of Khejuri CD Blocks in Purba Medinipur, West Bengal, India.’ Online at https://www.ijsr.net/archive/v3i11/T0NUMTQxMjUz.pdf (viewed on January 28, 2018). De, S.S. and Ramachandran, A. 2011. ‘Marketing Channels in Ornamental Fish Trade in West Bengal.’ Fishery Technology. 48(2): 163-170. Dey, V.K. 2016. ‘The Global Trade in Ornamental Fish.’ INFOFISH International 4: 52-55. Ghosh, I. 2016. ‘Aquariculture and Sustainable Rural Development: Studies from West Bengal, India.’ International Journal of Innovative Research & Development. 5(6): 375-379. India Today. 2017. ‘MPEDA launches scheme for ornamental fish breeding units.’Kochi, May 15. India Today. Online at https://www.indiatoday.in/pti-feed/story/mpeda-launches-scheme-for-ornamental-fish-breeding-units-926470-2017-05-15 (viewed on January, 2018). Maheshwari, M. and Goyal, S. 2014. ‘Role of Self Help Groups in Socio-Economic Empowerment of Women: A Review of Studies.’ Pacific Business Review International 7(2): 85-93. Mandal, B., Dutta, C. and Laha, U. K. 2012. ‘Freshwater Ornamental Fish farming as a tool for Socio-economic development of backward women Self Help Groups (SHG’s) to restore livelihood security.’ International Journal of Advanced Biological Research 2(1): 95-98. Ninawe, A.S. and A.D. Diwan. 2005. ‘Women in Fisheries sector and entrepreneurship development: Steps for improvement.’ In: Women Empowerment in Fisheries, 1-16. Narendra Publishing House, New Delhi. Pal, S. 2015. ‘A study on Diversity of Indigenous Ornamental Fish Species available in Howrah District of West Bengal, India.’ International Journal of Applied and Pure Science and Agriculture. 01(8): 137-148. Paul, B. and Chanda, A. 2014. ‘Indigenous Ornamental Fish Faunal Diversity in Paschim Medinipur, West Bengal, India.’ International Research Journal of Biological Sciences. 3(6): 94-100. The Hindu. 2017. ‘2,500 ornamental fish traded globally.’ The Hindu. Mangaluru, May 11. Online at http://www.thehindu.com/news/cities/Mangalore/2500-ornamental-fish-trade...(viewed on January, 2018). Vinayak, A.J. 2017. ‘Aquarium trade will be worth Rs. 1,200 cr in a decade: expert.’ Business line May 15. Online at http://www.thehindubusinessline.com/economy/agri-business/aquarium-trade-will-be-worth-1200-cr-in-a-decade-expert/article9699877. ece (viewed on January, 2018).